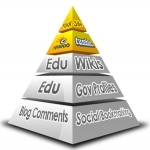 What is a Backlink Pyramid? A backlink pyramid is a multi-tiered, pyramid structure of backlinks that is designed to pass link juice from one tier to the next and, ultimately, feed into your main website. Find out what the components of a backlink pyramid are and how they are designed to boost SERP rankings. One of the backlink strategies that you will often see on SEOClerks and on other SEO websites and SEO forums is the link pyramid, or backlink pyramid. Backlink pyramids were one of the very first SEO strategies that SEO experts applied when search engines first announced that they placed a value on the backlinks that point to a website. The concept of a backlink pyramid is very simple and most people agree that a properly implemented backlink pyramid can be very effective. A pyramid of backlinks is also the way that links to a website would occur naturally over a long period of time. 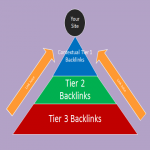 A backlink pyramid usually consists of three or four separate tiers of links. The highest quality backlinks, and the ones that point directly to the main moneymaking site, are at level 1, the lowest quality links, which could otherwise even be considered to be spam, are at the lowest level of the pyramid. Different SEO suppliers will use different formats of backlink pyramids and they might use different types of links, websites, and platforms to create the various levels of backlinks, but the basic principal of a backlink pyramid will stay the same. The backlinks in tier 1 would be high quality, high PR links from web 2.0 properties, such as good social bookmarks, blog posts, or articles. At this level, the page or post would be manually created, well worded and well formatted or, in other words, a proper looking web page. As these are the links that would be pointing directly at a main website, they would look in no way like they are spam or have been automatically generated. Tier 2 links in a link pyramid will be medium quality links which will point to the Tier 1 links. These might be good quality spun articles, links from article directories, wiki links and other low PR types of backlinks. Ideally, Tier 2 would contain a mixture of no-follow and do-follow links, because that would look more natural. The aim of the second tier is to strengthen the value of the first tier links and improve the indexing of them. There should be multiple tier 2 links pointing at the tier 1 links. The tier 3 backlinks are the lowest quality backlinks and the ones that some people might call spam. Backlinks at this level might come from low quality social bookmark sites, wiki links, blog comments and other automated or easy to acquire backlinks. The purpose of tier 3 is to feed a large number of low PR links into the tier 2 backlinks to strengthen them. At this level, large numbers of backlinks are used; because search engines are unlikely to index a large proportion of the links. How effective are backlink pyramids? Backlink pyramids can be extremely effective if they are implemented correctly and they are used as a part of a diversified blacklining campaign. What is important is that the tier one links are excellent, the tier two backlinks are of reasonable quality. The pyramid structure also has the effect of sheltering the main moneymaking site from the mass of poor quality links at the bottom of the structure, thus averting the wrath of the search engines. As with any link building strategy, it must be remembered that there is no better backlink than a natural backlink and the way you get those is by having top quality content on your site and publishing things that people will want to share or refer to. You can build your own backlink pyramids by publishing your own high quality tier 1 and 2 links and then using cheap backlink building services form sellers on SEOClerks. Alternatively, you can employ the services of an SEO supplier to build the pyramid for you. Blog Link Pyramids What is a Link Pyramid?